In examining the representation of gender roles on Glee, it’s perhaps easiest to start with the show’s portrayal of traditional masculinity, as it interacts heavily with the show’s core themes. McKinley High School is depicted as an environment with a strict power structure implicitly defined by the characteristics associated with masculinity: the athletic programs are the top dogs in the school, with the football players among the most popular and powerful - even though they’ve been a losing team for at least half the show’s run. Sports are traditionally a “man’s pursuit,” where aggression, competition, independence, and strength are prized qualities. The connection between masculinity, athletics, and power is threaded intrinsically in the presentation of the show’s main conflicts: from the very beginning, it was clear that the male athlete characters in Glee were uncomfortable with being perceived as gay. Traditional masculinity, and the value that it places on all things “masculine,” tends to breed a discomfort, and even disdain, for all things “feminine” - in both the female and male forms. Essentially, this is misogyny, and homophobia, respectively. 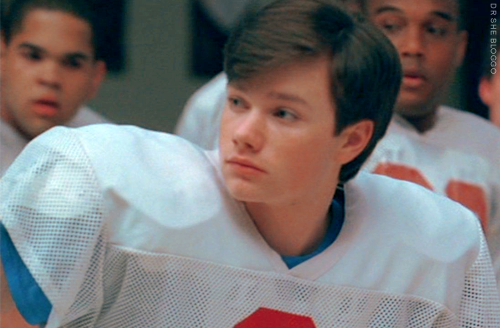 From the show’s first episodes, Glee made it a point to break down this barrier in masculinity - in the fourth episode, “Preggers,” Kurt, a gay male, joins the football team and actually leads them to victory. Not only that, but the players learn Beyoncé’s “Single Ladies” dance and perform it during the game, in an effort to distract their opponents. From that day forward, one of Glee’s recurring themes has been a discourse in modern masculinity and what it means to be a man. At the center of this discussion is, of course, Kurt Hummel, a young gay man attending high school in narrow-minded Lima, Ohio. There are three primary dynamics that speak to the representation of masculinity and how the show aims to break down the associated homophobia - all between Kurt Hummel, an “effeminate” male, and three different “masculine” males. The first is Finn Hudson, the well-intentioned quarterback who joins glee club and is consequently forced to confront a loss in status and the taunts of his football teammates. The second is Burt Hummel, Kurt’s father, a widower who runs a tire shop, watches sports, and has little in common with his son. He is designed, through masculinity, in direct foil to Kurt’s “feminine” traits. And thirdly, Dave Karofsky, a popular jock who bullies Kurt out of insecurity in his own sexuality. These three relationships, combined with Kurt as a central emotional figure in many of the show’s storylines, have resulted in no short order of reinterpreting masculinity through storyline. In “Preggers,” as previously mentioned, the football team dances suggestively to Beyoncé; in “The Power of Madonna,” the guys are encouraged to think about what it’s like to be a girl; in “Theatricality,” Finn freaks out about Kurt’s effeminate decorating, Burt lectures him on the toxicity of homophobia, and the glee guys embrace heavy stage makeup as part of performance. In “Furt,” Burt and Finn learn to dance with Kurt in preparation for Burt and Carole’s wedding, and in “Prom Queen,” Karofsky as well is confronted with the prospect of dancing with another guy. But even as early as the Pilot, Glee confronts the issue of modern masculinity and the implications of manhood. The glee club is originally regarded as something that is “gay,” completely devoid of masculine qualities (even its original male members are somewhat “emasculated” - Kurt is gay, and Artie is physically handicapped) and for the “masculine” male characters, it is just as much about being perceived as gay as losing status in the school’s power structure that causes turmoil about being in the club, or even associated with it. But it takes two masculine men - Will and Finn - to put the glee club together for the show’s purpose. Will and Finn are designed as the “good guys trying to do the right thing.” They are popular athletic guys, but not jerks like Puck or Karofsky. They love performing, but they’re not gay or nerdy. There’s a lot of pressure on them to be “leaders” and they feel like they always need to step up. There’s a very specific ethos surrounding the mirrored portrayals of Finn and Will, and it connects very strongly to the idea of traditional masculinity. This attitude was hammered in further through Quinn and Terri pregnancy plotlines, as Will and Finn expected to be fathers within the first few episodes. As such, Puck also interacts with this notion to a certain degree. 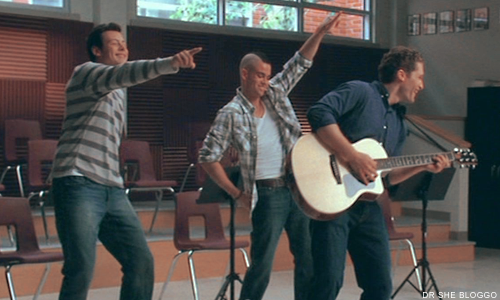 Not-so-coincidentally, Will, Finn, and Puck all lack strong father figures. (It’s also not-so-coincidental that it's Rachel and Kurt who lack mother figures and Sue and Quinn have overbearing/bullying parents.) Finn’s dad died fighting in the Gulf War, and ever since, as an only son of a single mother, Finn seemed to struggle with the concept of masculinity - what it means to “be a man.” Finn’s original First 13 arc is about readying himself to be a father and fully committing to the glee club, resulting in him “saving the day” at Sectionals - even despite his emotional devastation. And through the entire course of the narrative, Finn seems to struggle to find a father figure that he can emulate - with straightforward suggestions that Mr. Schuester, Burt Hummel, and even Kurt are filling those shoes. With Puck, the discovery of his accidental paternity resulted in an immediate promise to be better than his own deadbeat dad. Both Finn and Puck, as potential fathers to Quinn’s unborn baby, promised to be, and were pressured to be, providers - financially and emotionally - who were present in their kids’ life, unlike their own dads. Both boys welcomed the chance to prove themselves to be good fathers, and ultimately, Quinn deprived both their characters of that opportunity for masculine expression by denying them paternal access to the baby. Will’s father is portrayed specifically as lacking guts - he doesn’t “have the balls” to go after what he wants. In “Acafellas,” he visits his son and confesses that he always wanted to go to law school, but didn’t have the confidence. This inspires Will to fulfill his own dreams so he can make his own son proud, and pass on the concept that Real Men Have the Balls To Do What They Want. “Acafellas” is a problematic episode for this very reason. Will’s dad imparts some sage gender-specific advice to his son from the start - “Being a good father and a good man is about guts” - and from there, the episode’s theme of confidence is really only applied to the male characters. It’s completely acknowledged in the writing, too: when Rachel questions Mr. Schue’s reaction to her criticism, Finn replies, “Guys are real sensitive when it comes to that kind of stuff.” So, Will works tirelessly at his boy band (no girls allowed!) so that he can feel confident and empowered - because Rachel, a woman, insulted his choreography… when she was instigated by two bitchy cheerleaders who were instigated by one bitchy cheerleading coach trying to tear the club apart. The one female with an emotional storyline in “Acafellas” is Mercedes, and she is actually denied the opportunity to demonstrate confidence. She bemoans her lack of boyfriend, and vandalizes Kurt’s car when he tells her he’s in love with someone else. If that storyline alone weren’t enough to be vaguely troubling as a somewhat two-dimensional representation of a teenage girl, the emotional conclusion of it actually results in a male character expressing confidence: Kurt, at episode’s end, has the guts to tell Mercedes he’s gay. The only expression of female confidence through storyline arc is Rachel standing up to Dakota Stanley and firing him from the club - which is framed more as Rachel being a representative of glee club as a whole and establishing the club’s insistence on embracing their differences - she’s technically the last holdout of the heroes when it comes time to make a decision. But, as a main character and embodiment of the glee club, Rachel at least benefits from an intrinsic level of empowerment when it comes to her “star quality” and individual performance identity. The way that Glee wields characters like Kurt, Will, Finn, Puck, Burt, and Karofsky specifically identifies the show as a study in masculinity, to varying effect. While it’s damaging perhaps to rely heavily on delineating “what it means to be a man,” the show also takes great care to help redefine that for modern times, with Kurt especially, as a gay male, in mind. Homophobia is assuaged, and a masculinity that embraces what has been stereotypically defined as “gay” is forwarded. But there is no effort to alleviate the misogyny inherent in traditional masculinity, nor is there attention paid to any discourse on femininity. It’s clear, through several comparisons across gender lines. Finn and Quinn are the star quarterback and the head cheerleader, the school’s standard “power couple,” represent the norm. For Finn, he has been incorporated into the outcasts through the construct of masculinity that define many of his interactions with Kurt. 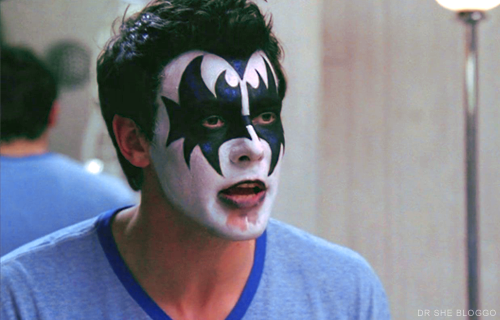 With development over the course of two seasons, these characters are now brothers, with Finn confessing to Kurt that he, Kurt, taught him how to be a man (“Furt”). There has been closure on the angst of this relationship. It would seem, in the interest of mirroring the thematic resolution of the popular kid accepting the loser, that Quinn would experience a similar closure with her own outcast foil: Rachel Berry. And while Rachel and Quinn don’t inherently have the nature of masculinity as a point of interest, the fact of the matter is that Finn and Kurt’s relationship has ultimately been able to transcend the concept of traditional masculinity in its overall construction, whereas Rachel and Quinn’s relationship is instead stuck in rather transparent and somewhat stereotypical representations of femininity. 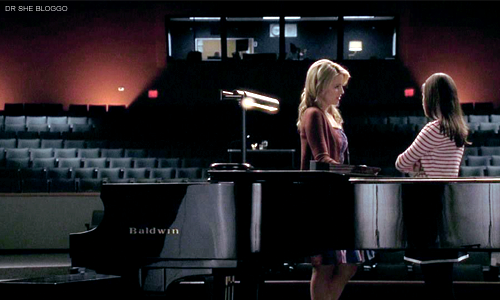 Upon Quinn’s pregnancy, Rachel defies expectation and extends acceptance to Quinn in her moment of need - and then sabotages Quinn’s relationship with Finn for her own personal gain. But, Rachel apologized for the transgression, Quinn accepted, and the quiet détente that settled over them (“Sectionals”) seemed to indicate that these two ladies could move past their boy troubles and perhaps relate on a more personal level, doing justice to a once-venomous female relationship. Alas, no. In the wake of that possibility, Rachel and Quinn have continually been boomeranged into conversations about their relationships with Finn, and on top of that, a second layer of interaction has been introduced in the most basic of ways - dealing with physical attractiveness. Rachel covets Quinn’s perfect nose, citing her as the prettiest girl she’s ever met. Their duet, a haunting tapestry of “I Feel Pretty” and “Unpretty” is largely limited to the superficial jealousy of physical looks, and the accompanying storyline doesn’t really dig deeper into the psychological similarities between these two girls. What’s worse, these interactions are all padded out with a consistent hostility: Rachel calls Quinn a “teenage trollop” and “vindictive harpy,” Quinn professes that she wants to “punch [Rachel] in the face,” and then actually does haul off and slap her for supposedly having a hand in Quinn’s loss of the prom queen crown. After forty-four episodes, Rachel and Quinn have not reached any sort of similar resolution as Kurt and Finn - after many false starts that seem to indicate a pending progress. In “Prom Queen,” Quinn let Rachel wipe away her tears, and two episodes later she was plotting against Rachel in New York because Finn had his sights set on her again. And so, Rachel and Quinn’s dynamic is largely reduced to fighting over a boy, random name-calling, and the somewhat two-dimensional representation of physical attractiveness. Quinn and Rachel’s dynamic is handled terribly under the duress of gender issues. When compared to Kurt and Finn’s, it reveals a lack of interest in a real discussion on the female experience, and therefore a slight misogyny (or simply lack of understanding) in the writers. This dichotomy also takes shape in the show’s treatment of Kurt vs. Rachel in terms of bullying. Both characters have experienced extreme ostracization and emotional abuse from peers for being different or unpopular. They are unpopular students, at the bottom of the social ladder, because they don’t fit in with the norm. However, Kurt’s experience as a bullied character was channeled into a storyline at the forefront of the show, taking up a multi-episode arc. It was given progress, and resolution through storyline. This is valid. Kurt, as a character, deserved to see his oppressors being held accountable for their actions. However, so does Rachel - and that’s something that’s been largely absent from any real storyline. While it’s true that her teammates are not nearly as belittling as they used to be, Rachel has experienced very little emotional resolution with her loser status, and the bullying she received as a result. Most instances of the other characters treating Rachel nicely are random and unearned (“Original Song”) because no effort was made to resolve them through storyline, unlike with Kurt’s. In the end, Kurt is bullied because he’s gay, but Rachel is bullied because she’s simply annoying. Addressing Kurt but not Rachel is another manifestation of assuaging homophobia that creates an unintended (hopefully) byproduct of misogyny. Kurt’s treatment also plays in contrast to Santana, who stands squarely at this juncture as Glee’s only gay female character. Santana’s relationship with Brittany was revealed to be sexual in 1x13, and over a season later it was finally given a storyline. Santana’s sexuality was originally unintended, and then marginalized for thirteen episodes at least, twenty-three at most (depending on interpretation). Kurt’s sexuality was originally planned, and then manifested into storyline in 1x03 as well as 1x04, 1x09, 1x16, 1x18, 1x20, and has been at the forefront of his entire Season 2 arc. The difference, in gender analysis, would indicate that Kurt’s sexuality, in the narrative, subverts traditional masculinity and redefines what manhood means. However, in that she is female, having Santana’s sexuality engaged in the narrative means that her character would redefine what being a girl means. In keeping Santana’s sexuality background for thirteen episodes (or twenty-three - your call) the Glee writers seemed to be sending the message that varying their paper-thin concept of femininity was originally not in the cards. In an interview with Heather Morris in May of 2010, she communicated that “Brittana” were probably going to remain “BFFs” because, word was, Glee was “not that kind of show.” While this could play as incredibly offensive, indicating that lesbian relationships are somehow not appropriate for television, I think it also heavily speaks to the idea that lesbian relationships are usually played for titillation of the male audience - from the male POV. The first thought was that Brittana wouldn’t be for the benefit of its own characters, but for the “shock factor” of two girls kissing. The fact that Santana’s sexuality storyline is now being wielded with its own place and its own purpose in the narrative is huge, and commendable - but it wasn’t always going to be that way, and it’s only just begun to take its place at the forefront. In all, the construction of McKinley High School as a playground for Glee’s main themes has created an environment that rewards traditional masculinity, and through characters such as Finn, Will, Puck, Burt, Karofsky, and Kurt, creates a discussion about masculinity and the true meaning of a man - with the intention of assuaging homophobia. In and of itself, this is certainly a worthwhile and commendable pursuit. However, through comparing and contrasting the lengthy discourse on masculinity with the show’s haphazard treatment of femininity, Glee has inadvertently upheld misogyny through careless writing and lopsided narrative design. I would take issue with the way you frame Kurt v. Rachel as a bullying thing. There is most definitely a major double-standard with how Kurt's bullying was handled in Season Two compared to Rachel's, but it wasn't solely a matter of Rachel. Kurt's bullying was handled differently from everyone else's, male or female. Originally the show played bullying in general for laughs, inhabiting a largely slapstick universe (with occasional moments where its impact was taken seriously); when they changed that in Kurt's case, they didn't do it for anyone else. So, for instance, the episode after Kurt is driven from school, Karofsky (the same guy who bullied Kurt) and a bunch of other guys beat up Puck and lock him in a lavatory overnight, an action far worse than anything that happened to Kurt, and it was played for laughs. I don't think it was a gender double-standard, it was a Kurt vs. Everyone Else double-standard. The other issue is that the writers rely on insult comedy to an enormous degree, so addressing verbal bullying (the kind that Rachel receives) would undermine their continued use of it. 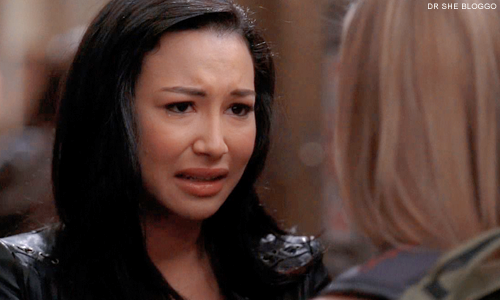 They're never going to tell Santana to stop, because they love writing Santana's barbs. Though going back to the earlier paragraph, they're never going to stop slushying people with wacky music playing either. Very interesting analysis of Glee. Pretty much every discussion I have about this show revolves around it's rather ugly ideas of gender and how it handles relationships (romantic or otherwise) through this lens. I am intrigued to read the rest of the series. I really hope that you touch upon female masculinity, particularly through Coach Beiste, because she is perhaps the most interesting character on the show in the aspect of gender. I also am interested to see how you tackle the rampant, unapologetic cissexism that this show deals in on a regular basis.